Join Macky, Portia in an epic animated journey of discovery across the ancient world. As they fight for justice and even survival against the might of the Roman Empire, they become friends and then, in turn, heroes. 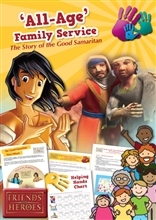 Throughout these exciting adventures Friends and Heroes brings the inspiring stories of the Old and New Testaments of the Bible to a new generation of children worldwide, who will be empowered by what they see and hear, as they share the courage and compassion, the everyday dangers faced by Macky and his friends. Help your church explore what it means to be a true friend! An exciting and fun Party Pack for churches and others involved in children's ministry to use on October 31 or any other party occasion.